a. To support Fort McCoy’s military training and mobilization requirements. b. To manage the forest resource according to ecosystem management principles while providing a sustained yield of forest products. c. To manage for forest health. Specific pests that are monitored or actively managed against include jack pine budworm, oak wilt, gypsy moth, white pine tip weevil, annosus root rot, and pine bark beetle. d. To provide for other multiple uses of the forest resources like outdoor recreation, wildlife habitat, soil erosion protection, watershed protection, clean air and noise abatement. 1) Training improvement harvest to reduce tree density or create openings to benefit military training; 2) Intermediate harvest to remove some of the trees in the forest to give the remaining trees more growing space; 3) Salvage harvest to remove dead and dying trees or to remove trees for a land-use change; 4) Regeneration harvest to remove trees in order to regenerate the forest. Timber harvests may occur in any forested area of the installation except where they are not allowed such as the NIA, riparian areas, and cultural resources sites eligible for inclusion in the National Register of Historic Sites. Ecosystem management recognizes that endemic levels of insects and disease play a vital role in maintaining a healthy forest. Epidemic outbreaks of pests are prevented through the use of silvicultural practices and monitoring. Specific pests that are monitored or actively managed against include; jack pine budworm, oak wilt, annosum root rot, gypsy moth, white pine tip weevil, emerald ash borer and pine bark beetle. The Wisconsin Department of Trade, Agriculture and Consumer Protection (WDATCP) completes surveys on Fort McCoy using 100 gypsy moth traps (Figure 22) each year as part of the USFS program “Slow the Spread”. The traps are baited with female gypsy moth pheromones and placed on a grid of about one per square mile. This is done to survey the moth population to determine if more aggressive control measures are needed. In 1996, four gypsy moths were captured and the number has been steadily increasing each year. The trapping numbers went down to a low of 6 in 2005 but then increased to 538 in 2010. Before 2009, the trapping program was completed with forestry staff using WDATCP supplied traps, starting in 2009 the trapping on Fort McCoy was taken over by the Monroe County gypsy moth trapper funded by WDATCP. Fort McCoy will request trapping results from within the installation to keep track of the overall trend on Fort McCoy. An EAB detection survey was conducted in 2014 before it was known that an EAB infestation was 15 miles away from the installation. A total of four sticky traps baited with chemical attractants were place in four locations in May; Silver Creek, PineView campground, Cantonment Area, and Alderwood Lake. The traps were removed in September and no EABs were found. Trapping is discontinued with the discovery of the nearby infestation. 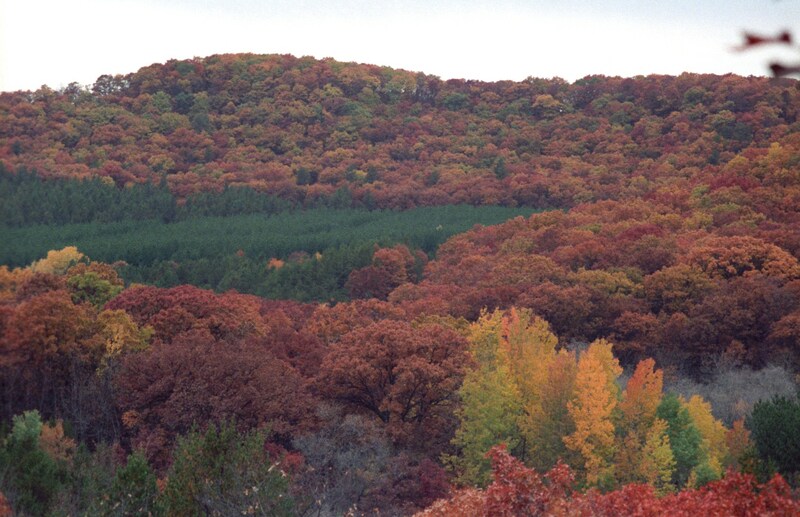 Fort McCoy places an emphasis on natural reforestation by using timber sales to create proper seedbed and light conditions for the targeted tree species. Northern red oak and jack pine seedlings are shade intolerant and are typically regenerated using seed tree, shelterwood, or clear cuts. Vegetation control may be needed before or soon after the timber sale to remove competing plants. Artificial regeneration may be accomplished by hand planting or machine planting, depending on the size of the area, advance regeneration present, and access restrictions. Large areas of red pine have been planted in the past but are seldom planted at this time; open areas are more valuable as grassland or barrens habitat than pine plantations. Hand planting is often accomplished by school groups or Boy Scout organizations as part of classroom learning or to complete community service requirements.